The role of parents and parenting in the lives of children is undeniable. 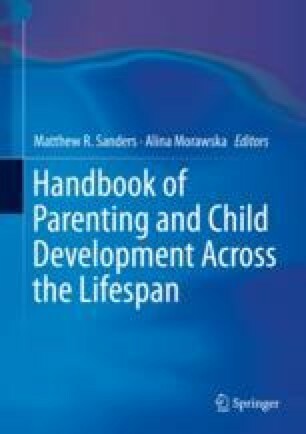 In this final chapter, we provide an overview of key research, policy, and practice directions stemming from the earlier chapters as a means to support parents, communities, and policy makers in promoting children’s development. In particular, we focus on the importance of research taking a lifespan perspective to parenting, one that is more inclusive of the role of fathers, and that takes a more systematic and thorough approach to examining the role of culture. Furthermore, increasing focus on both child and parent self-regulation, as well as the underlying biological underpinnings are discussed. Finally, we emphasize the value of more research exploring mechanisms of change in interventions. From a policy and practice perspective, we focus on ways in which the social ecology of parenting can be enhanced, with particular emphasis on taking a systems-contextual approach, which is delivered at a population level. Such a system also needs to have greater emphasis on integrating prevention and treatment approaches, using multidisciplinary methods and integrating parenting interventions within the broader field of parent and child development support. The Parenting and Family Support Centre is partly funded by royalties stemming from published resources of the Triple P—Positive Parenting Program, which is developed and owned by the University of Queensland (UQ). Royalties are also distributed to the Faculty of Health and Behavioural Sciences at UQ and contributory authors of published Triple P resources. Triple P International (TPI) Pty Ltd. is a private company licensed by UniQuest Pty Ltd. on behalf of UQ, to publish and disseminate Triple P worldwide. The authors of this book have no share or ownership of TPI. TPI had no involvement in the writing of this book. Matthew R. Sanders is the founder of Triple P and receives royalties from TPI. He is a consultant to Triple P International and an employee at UQ. Alina Morawska receives royalties from TPI and is an employee at UQ.